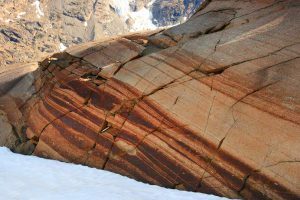 Rhythmic layering in plagioclase-augite-olivine cumulates of the Lower Zone of the Skaergaard Intrusion (Greenland). Individual layers are typically tens of centimetres thick and display variable gravitational sorting of minerals. Small autolithic blocks, derived from the roof zone of the intrusion, were embedded into the cumulate as it formed. Photo by Jens C. Ø. Andersen, University of Exeter. From a distance, one would assume a layered igneous intrusion is an outcrop of sedimentary rocks. They possess many similar features such as horizontal layering, graded bedding, flow banding, and scour channels. Yet, on closer inspection, one finds that these structures are not the result of sedimentary deposition but are linked to the compositional, thermal, and fluid dynamics within a magma chamber. As you will find in the articles in this issue, layered igneous intrusions provide a window into the complex magmatic plumbing systems of Earth and are valuable sources of ores that we depend on for our daily lives. In our final issue of 2017, we like to take a moment to extend our appreciation to the guest editors and authors who contributed to the six issues of volume 13. These men and women volunteered their valuable time for writing interesting and accessible articles for Elements’ scientifically diverse audience. We also thank our feature editors (Ian Parsons, Michael Wiedenbeck, Cari Corrigan, and Andrea Koziol) who produce the Parting Shots, The Elements Toolkit, CosmoElements, and the Meetings Calendar. We also acknowledge the reviewers, our copyeditor Patrick Roycroft, and our graphic artist Michel Guay, who diligently work in the background to bring Elements to life. In addition, we thank our advertisers for their continued support. Please take the time to speak with their representatives about their products and services. Those that advertised in 2017 were Analab, Australian Scientific Instruments (ASI), CAMECA, Crystal Maker, Deep Carbon Institute, Dr. Eduard Gübelin Association, Elemental Scientific, Excalibur Minerals Corporation, Gemological Institute of America, Geological Society of London, International Center for Diffraction Data, International Mineralogical Association, IsotopX, National Electrostatics Corporation, PANalytical, ProtoXRD, Rigaku, Savillex, Selfrag, and the Society for Economic Geologists. Special mention goes to Analab, Australian Scientific Instruments, CAMECA, Excalibur Minerals Corporation, ProtoXRD, Savillex, and Selfrag who advertised in each issue during 2017. We also want to thank the 17 participating societies who faithfully support this magazine. Without them, Elements wouldn’t exist. The Elements Executive Committee, consisting of representatives from our participating societies, are greatly appreciated for their oversight and guidance. You can read more about their activities on pages 376-377 of this issue. Our lineup is complete through 2018 (see our preview for 2018 on pages 374 and 375), but there is so much more to cover. If you have ideas for a thematic issue, contact one of our principal editors and submit a proposal for our consideration at our late-January 2018 editorial meeting. At that time, we will be determining our lineup for the last half of 2019 and early 2020. More information about publishing in Elements can be found at elementsmagazine.org/publish-in-elements/. Best wishes to everyone for the coming year.